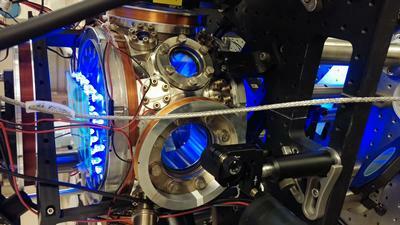 Researchers from the University of Southampton have demonstrated for the first time a new laser cooling method, based upon the interference of matter waves, that could be used to cool molecules. Our ability to produce samples of ultra-cold atoms has revolutionised experimental atomic physics, giving us devices from atomic clocks (the core of GPS) and enabling a range of quantum devices, including the possibility of a quantum computer. However, the current technique of cooling atoms down from room temperature to the ultra-cold regime using optical molasses (the preferential scattering of laser photons from a particle in motion which leads to slowing) is limited to atoms with favourable electronic structure. As a result, only a small fraction of atomic elements, along with a select few diatomic molecules, have been cooled in this manner. Writing in Physical Review Letters, the research team at Southampton has provided the first proof-of-principle demonstration of a new laser cooling technique, based on a proposal by Martin Weitz and Nobel laureate Ted Hänsch in 2000, which is in principle applicable to atoms and molecules as yet untamed by conventional laser cooling. Using the new approach, which harnesses the quantum interference of matter waves, the team was able to cool a sample of already-cold Rubidium down close to the fundamental temperature limit of laser cooling. The cooling technique is based on matter wave interferometry, in which an atom (the matter wave) is placed into a superposition of states by a laser pulse. The atom travels simultaneously along two paths, which interfere at a later time, and the impulse imparted to the atom depends on the difference between these paths. 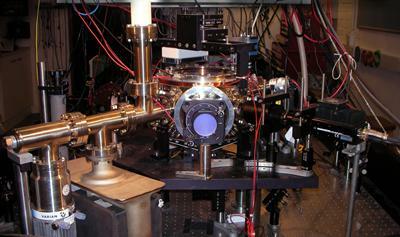 The same phenomenon can be used to engineer an extremely sensitive metrological device. Fundamentally, the impulse depends upon how the difference in energy along the two paths compares with the energy of the laser photons, where the atom’s energy is formed of potential (internal electron configuration) and kinetic (external motion) parts. The clever trick behind Weitz and Hänsch’s scheme is to make the laser interact with the atoms in such a manner as to remove the dependence on the potential energy, and thus the internal electronic structure, leaving the interference based solely on the kinetic energy of the particle. The team at Southampton has demonstrated the principle of using matter wave interference to cool atoms. Their results are a significant step toward decoupling the cooling mechanism from the internal electronic structure – the 'Holy Grail' of general molecular laser cooling. Dr Alex Dunning, from Physics and Astronomy at the University of Southampton and lead author of the study, said: “There is a great push to extend ultra-cold physics to the rest of the periodic table to explore a greater wealth of fundamental processes and develop new technologies and we hope that our demonstration will help.